The BT-42 Assault Gun was used by the Finnish Army to fight the Russian invasion of Finland during WW2. They were not very successful. Its HEAT rounds failed to penetrate the armour of the Soviet T-34 and KV-1 tanks. Many of the tanks were abandoned because of mechanical breakdowns. Only one survives and is at the Parola Tank Museum in Finland. 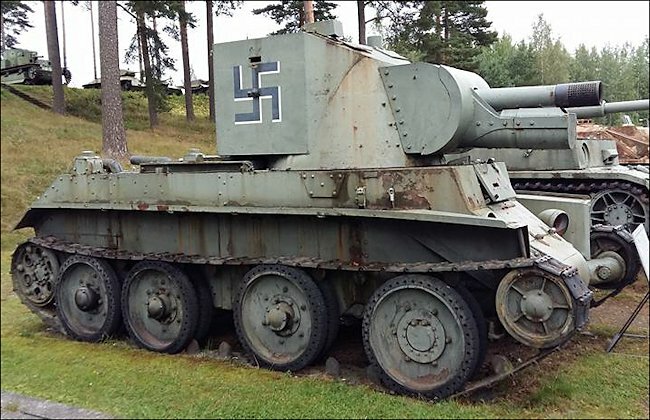 This tank is on display at the Finnish Armour Museum, Panssarimuseo in Parola, Finland. The Museum is to the south west of the town. It is 143 km north of Helsinki roughly a 2 hour drive up the E12 motorway. Set your Satnav for Parola. Turn off at junction number 27 on the E12. It is sign posted Hattula and Parola. Do not turn right to Parola. Turn left and follow the sign marked Parolannummi on the 3051 road. A few kilometres down the road you will see on top of an embankment on your right, a black steam train and a row of armoured railway wagons with the Finnish swastikas painted on them. Turn right at the next road. That will take you to the museum entrance. Look for the brown tourist sign with the words 'Panssarimuseo Armour Museum' on it and the Sherman tank at the gate. You can catch the train to Parola direct from Helsinki. It is only a 1.8km walk from the railway station or you can take the number 5 bus. Be careful if you decide to walk as there is no pavement for a good stretch of the route. 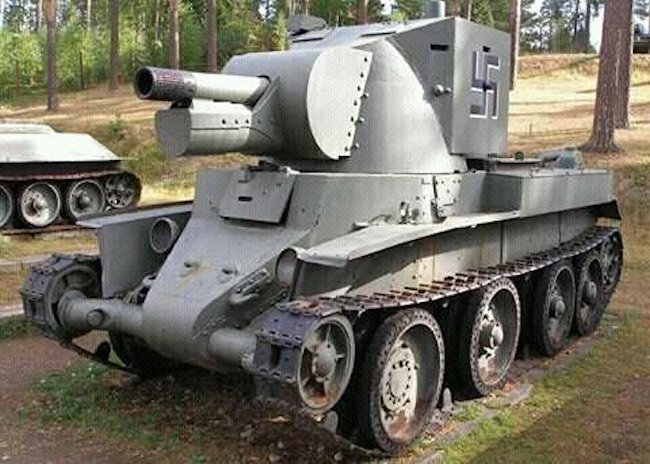 This assault gun was built on a captured Soviet BT-7 tank Hull. A British quick firing QF 4.5 inch Howitzer was fitted to a new larger turret. It had a maximum range of 7.5km (4.7 miles). It could fire HE, HEAT, Phosphorus and smoke shells. It was not fitted with a machine gun. It was powered by a M-17T 12-cylinder water cooled gasoline engine that produced 500 hp. The BT-7 had a top road speed with tracks fitted of 52 km/h (32 mph). It could also just use its road wheels without tracks. That increased its top speed to 72km/h (45 mph), but the extra weight of the larger turret and gun would have reduced these speeds. It had an operational range of around 250 km (155 miles). It had a crew of three: commander, driver and loader. They were protected by armour that ranged from 6-20mm in thickness. The new turret had 16 mm thick armour on the front and sides. only 18 vehicles were produced between 1942 and 1943. The Finnish Army needed a weapon that could destroy soviet and later German fortified strong points that protected machine gun nests, mortar teams and infantry gun crews. They had some British WW1 4.5 inch howitzers and some captured Soviet BT-7 tanks. The army decided that it would be a good idea to build an assault gun using these two weapons. The Soviet BT-7A artillery tank may have been an inspiration for this conversion design but this cannot be confirmed. Finnish Factories removed the turret from the captured BT-7 tank and fitted a different larger turret that housed the 4.5 inch artillery gun. It was given the Finnish Army designation 15 tonnin rynnakkotykkipanssarivaunu BT-42 (15-ton assault gun tank BT-42). But in practice it was more commonly known as the BT-42 or BT-rynnakkotykki (BT assault gun). The troops also gave it the nicknames of either 'Christie', 'Christian' or 'Kristian' due to being based an the American Walter Christie’s tank design. It was a very ugly looking tank with a high profile which made it an easy target to spot. Only 18 were built between 1943 and 1944. The reason it was given the number 42 was that was when the decision was made to build this assault gun, 1942. The soviet BT tanks were known as fast tanks because of their maximum road speed and Christie suspension. Normally a BT-7 tank could drive along a road using its tracks at 52 km/h. If the tracks were removed it could increase that top speed to 72 km/h. Its M-17T 12 cylinder gasoline petrol engine produced 500 hp so it was powerful enough to take the increased weight of the new turret and heavy gun but at a reduced speed. The government of Finland gave the contract for building the BT-42 to the Valtion Tykkitehdas (State Artillery Factory). This was a strange choice. It was a major repair facility for artillery weapons but had no experience with armoured fighting vehicles. They were experts at building anti-tank guns, field artillery howitzers and anti-aircraft guns but not tanks. The design team lead by engineer Oiva Rehnstrom were constrained by the existing materials they had been given to work with: the BT-7 chassis, its engine and the 4.5 inch 114H/18 howitzer. The driver's position on the BT-7 tank was at the front and in the middle. This prevented the gun being fixed low and to one side. The chassis was quite narrow so constructing a large open fighting compartment was not an option or ideal for Finland's harsh winter climate. A decision was made to build a larger rotating turret that would be capable of housing the 4.5 inch howitzer. Apart from the Red Army's KV-2 most WW2 assault guns were not fixed in turrets. The howitzer's recoil caused problems for the BT-7 chassis even though it was fitted with a 'pepper pot' muzzle brake and had a low muzzle velocity compared with other guns. The designers realised that the new vehicle would need a large turret to accommodate the gun moving backwards after each time it was fired and to be high enough to allow the howitzer to have high enough elevation to enable it fire as an artillery gun. In tests it was noticed that the recoil forces of the gun after it had been fired caused some additional problems. The turret moved so the gunner had to turn the turret each time the gun was fired to bring it back on to the target. This took time and reduced the rate of fire. The solution was found by the adding of a mechanical claw mechanism between the turret and the hull to allow temporarily locking of the turret to the chassis. This made sure that the turret would stay on target when the 4.5 inch howitzer was fired. The designers were already aware that adding a bigger turret on top of the BT-7 chassis would increase the weight of the tank. This would place an additional load on the engine and the suspension. An assault gun should be heavily armoured to enable it to get close to the enemy. This was not an option on this 1930s tank design. The BT-42 tank could successfully operate off-road only if the terrain was easy and the ground not too soft. The original thin BT-7 tracks were not replaced with wider tracks or extended to make them wider to decrease the ground pressure. This meant they had a tendency to get stuck in thick mud and sink in water-logged ground. The Finnish industry was not capable at this stage of the war to design and produce a new powerful diesel engine to replace the original gasoline petrol 500 horsepower M-17T water-cooled Soviet engine. The Finnish military criticized the engine for its high fuel consumption but not its power. They would have preferred it to be a diesel engine to reduce the fire risk as gasoline is much more combustible. The BT-42 Assault Gun had a very tall profile and was an easy targetr to spot. The BT-42 had 650 litres of fuel in its tanks: 400 litres in the rear fuel tank and two 125 litre side fuel tanks. It consumed around 100 litres per hour when being driven continuously. The maintenance interval of the BT-42 was very short compared to other tanks: it required a major overhaul after every 150 hours of use. The Finnish State Artillery Factory built all the BT-42 turrets and installed them on each BT-7 chassis. They fitted weach turret with the 4.5 inch howitzer and optical instruments. The vehicle was then transported to the Panssarikeskus (Armor Centre), for final equipment fitting before sending the completed vehicles to Finnish Army unit barracks. The engineering companies Oy Lokomo Ab and Crichton-Vulcan shipyard inspected and repaired six of the captured BT-7 Soviet tank hulls. Crichton-Vulcan tempered the steel plates once Oy Lokomo Ab had shaped them. The Finnish Armor Centre inspected and repaired the other twelve BT-7 tank hulls used to make the BT-42 tank. The BT-42 tank only had a three man crew. The commander who also functioned as the gunner sat on the right side of the turret. The loader sat on the left side of turret and the below them the driver operated his controls whilst sitting in the middle of front hull. The tank was not fitted with a close protection machine gun. The crew were issued with a Suomi M/31 submachine gun with 70-round drum magazines that was kept inside the vehicle. Vision slits and pistol ports with their own armoured covers, were added to the turret side and rear to enable the machine gun to be fired at advancing enemy infantry. Field trials by the Assault Gun Battalion started in early September 1942. They put the first batch of BT-42 tanks through their paces and sent the State Artillery Factory a long list of improvements that needed to be dealt with before any more tanks were sent to frontline units. The tank crews found that the chosen locations for main gun shells were in the wrong place. They interfered with the operation of the 4.5 inch howitzer and made access to the tank's battery problematic. A new armoured box was built and fixed to the mudguards to house the battery and the ammunition storage areas were re-designed. When fitting the gun to the turret it was the protective cover over the 4.5 inch howitzer's recoil mechanism was not upgraded. It was found that it could be damaged by small arms fire. A request was also made that the armour at the rear of the turret was upgraded to 16 mm from the original 10 mm to protect the crew from shell splinters and high velocity bullets. Armoured protective covers were fitted over the turret prism after complaints that they were too vulnerable to damage. A second prism was added to the turret at the same time to increase visibility on the battlefield. An extra hand wheel was added for the loader to use to help the gunner rotate the turret after complaints that the horizontal gun laying system was heavy to use. The large size of the turret was causing mobility problems. The first 13 vehicles were delivered just under four weeks behind the agreed schedule. In autumn 1943 the last five BT-42 tanks were delivered, over 18 months behind schedule. The reason for this was that the State Artillery Factory was busy upgrading the tanks already delivered to the tank battalion. They had been returned to enable the alterations to be fitted. The same new features had to be added to the last batch of tanks that were being built. Even with these new improvements the tank crews still found problems with the BT-47. In May 1943 Major V. Luovila, who was commander of the Assault Gun Battalion, made a report that listed all their concerns. He concluded that because of the vehicles poor cross country mobility and slow rate of fire it was not suitable as an assault gun. A list of further improvements that needed to be made was submitted. They included changes to the: howitzer gun sight and recoil system gaskets; the gun travel lock; the vertical elevation gun laying system hand wheel; the gun sight field of view; ammunition storage and top turret hatch. Some of these issues were dealt with while others like the turret hatch were not. The Finnish Army renamed the British quick firing QF 4.5 inch Howitzer Mk 2 the 114 H/18 light howitzer (114 mm howitzer model 1918). It was introduced into Army service in 1918. It was light weight and designed to provide close range support. This was not an anti-tank gun. Like most artillery guns it used a two part high explosive round that loaded separately. First the projectile was loaded followed by the propellant cartridge case filled with the correct amount of powder for the range of the target. During the Finnish Winter War with the Soviet Union, Great Britain had donated 24 of these howitzers. They arrived in January 1940 and another 30 howitzers had been bought from Spain that arrived in Finland in July 1940. They were used during the Continuation War as field artillery. The choice of this gun over other types of guns for mounting on the BT tank chassis has been queried in the past. It was not the most advanced gun or the one with the longest range. There was also an ammunition supply problem. The main thing it had in its favour was that it was available. The guns were modified before being fitted inside the new tank turret and given the new name of 114 Psv.H/18 tank howitzer. The gun had a maximum range of 7.5km (4.7 miles). It could fire the following Ammunition types: HE, HEAT, phosphorus and smoke. The 114 akr 32/41-35 Finnish-manufactured high explosive (HE) TNT or Amatol filled round. The 114 fsakrv 51/61-106E British phosphorus smoke projectile, weighed 15.65 kg. It was added to Finnish ammunition manuals 1st March 1942, but probably introduced earlier. The 114 sakrv 51/61 Smoke projectile was a mixture of silicon, zinc oxide and magnesium. It was added to Finnish ammunition manuals 1st March 1942 but again probably introduced earlier. The 114 hkr 42/C-18/24-38 is 32-18/24 high explosive anti-tank HEAT projectile used a German 10.5 cm Hl/C projectile warhead. It was introduced for anti-tank use and weighed 13.50 kg. It was added to Finnish ammunition manuals 1st July 1944 but again probably introduced earlier. Test firing suggested that it should have been able to penetrate 110 - 115 mm steel plate in 70 degree angle, but due to the poor quality armour plates used in tests, this gave a false picture. During the battle of Viipuri/Wiborg in June 1944 BT-42 used as assault-guns scored repeated hits to the front armour of attacking T-34/85 and IS-2 tanks but failed to cause any real visible damage. The British QF 4.5 inch Howitzer Mk 2 was first manufactured in 1918. It was an improvement over the Mk 1 as it had a reinforced breech structure and a new rifling universal twist (in which the rifling twist continued the same for whole length of barrel). The new rifling was introduced to make manufacturing of howitzer barrels easier. The optical equipment used with BT-42 turret was not ideal. This new turret was equipped with single periscope and two prisms, combined with the artillery howitzers dial sight recycled from 76 K/02 light field gun. These sights had 4X magnification. The tank crews in the BT-7 tank had better vision. The actual howitzer was manually aimed by gunner using hand wheels. 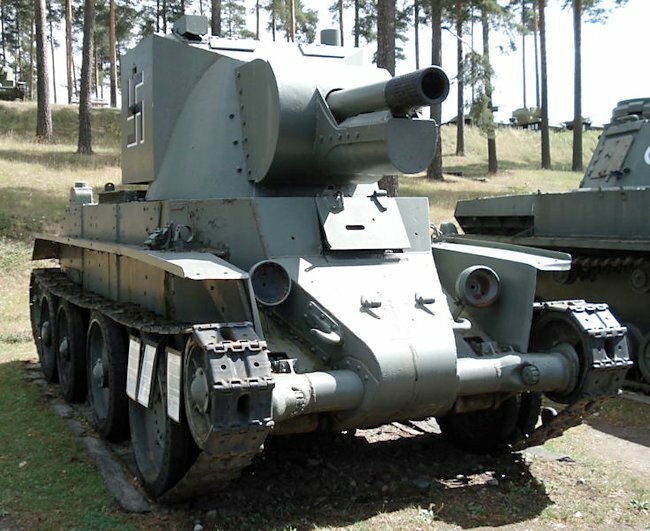 The horizontal gun laying system originated from BT-7, while the vertical gun laying system was a modified design based to one originally used in 114 H/18. Using both hand wheels simultaneously was impossible, which resulted gun laying system being quite slow to use. Elevation range of the howitzer was -5/+25 degrees. The Finnish army arranged for the newly converted BT-42 assault gun to be tested in battlefield trials. In the early summer of 1943 the 1st Company of the Finnish Assault Gun Battalion were given orders to proceed to the frontline by the River Syvari / Svir. They took with them five BT-42s: numbers R-704, R-708, R-710, R-713 and R-717. Red Army targets, like machine gun emplacements and strongpoints, were spotted on the other side of the river and the crews were told to destroy them using direct fire and occasionally indirect fire where they fired at targets plotted on a map out of sight from the crew. 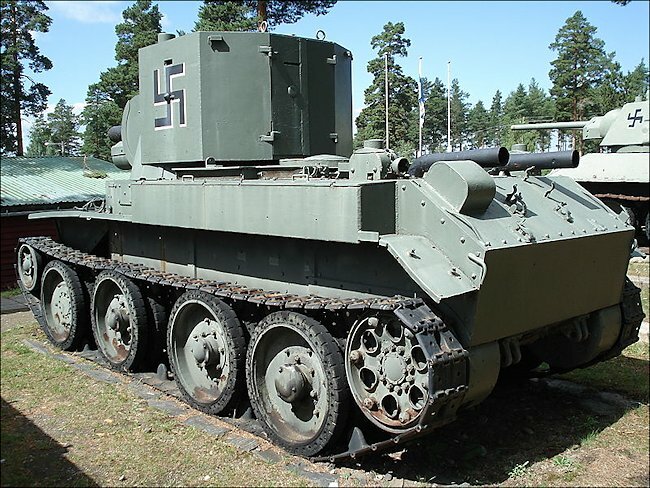 The success of the field trials firing test gave a false impression of this armoured fighting vehicles suitability as an assault gun to those in charge of the Finnish Army. They total ignored the negative reports from the Chief of Staff Finnish Armoured Division about the high profile and poor armour. There was an important out come from these reports criticising the BT-42. A decision was made to purchase German Sturmgeschutz 40 Ausf G. The wanted to buy 45 but German could only provide 30 in 1943. These were true assault weapons. Low profile, good armour and powerful main gun. The StuGs could not be used with the BT-42. The enemy would spot their location and send artillery barrages to cover that area. The best redeployment of the BT-42 would have been to an Erillinen Panssaripatteri (separate Self-propelled Artillery Battery). This vehicle was ideal for firing at targets plotted on a map that they could not see. The infantry was desperate for more artillery support that could keep up with the troops. This did not happen. Instead in November 1943 twelve BT-42 SPGs formed a new unit called the Erillinen Panssarikomppania, (a separate Tank Company). It was to fight like a tank, firing at targets it could see, direct fire. Later this new Tank Company had 14 BT-42 organized as HQ-unit equipped with two BT-42 assault guns and two platoons each having six BT-42. Due to mechanical breakdowns by 10th June 1944 it only had 11 assault guns in working order. The HQ-unit had 2 x BT-42, the 1st, 2nd and 3rd Platoons only had three BT-42s each. The Panssaripatalijoona (Tank Battalion) of Finland had managed a number of successes during the Continuation War with the Soviet Union that started in June 1941. Its tanks spear-head the offensive from Tuullosjoki River to Syvari/Svir River and then onto the city of Aanislinna / Petrozavodsk. In early 1942 a decision was made by the Finnish Armed Forces leadership to expand the Panssariprikaati (Tank Brigade/Regiment) to have a new 3rd Battalion. The existing 1.Panssaritykkipataljoona and 2.Panssaritykkipataljoona (1st and 2nd Tank Battalions) would use tanks purchased by the Government of Finland from Britain and Germany. The new 3rd Battalion would be called the Rynnakkotykkipataljoona (Assault Gun Battalion). Initially the plan was just to call it the 3.Panssaritykkipataljoona (3rd Tank Battalion) and just equip the Finnish Army tank crews with captured Soviet BT-5, BT-7, T-28 and T-34 tanks but it was found that there were not enough battle ready tanks so the plan was changed. The new 3.Panssaritykkipataljoona (3rd Tank Battalion) was to be comprised of three Companies each equipped with six BT-42 assault guns armed with the 4.5 inch British howitzer. The BT-42 tank crew driver and commander came from the Finnish tank regiment but the gunner and loader were recruited from the Finnish Artillery batteries, most were volunteers. The Rynnakkotykkipataljoona 1st Company received its first BT-42 assault guns on the 26th February 1943. The 2nd Company received its first assault guns on the 23rd March 1943 and the 3rd Company got its first assault guns on the 14th May 1943. The first eleven BT-42 tanks were give individual identification numbers that started with the letter 'R'. The last seven vehicles were identified by Ps. Numbers that started with Ps. 511. The BT-42 tanks of the Erillinen Panssarikomppania, (a separate Tank Company) were sent to the Carelian Isthmus in June 1944. Initially only nine of the fourteen vehicles were operational. They first saw action 17th - 18th June 1944 and later on the 20th June 1944 at the battle of Viipuri (Wiborg / Wyborg). Lieutenant Sippel was in command of the BT-42s. He suggested to the brigade commander Colonel Armas Kemppi, that they would be best used to provide indirect artillery support. This advice was totally ignored and the four platoon of two tanks were positioned hull down on the front line at different locations to use direct fire at the advancing soviet troops and infantry. They found that the high explosive anti-tank HEAT round they had been given did not penetrate the T-34 or KV-1 tank's armour. The Company commanders tank was knocked out by a T-34 tank shell hitting the turret killing the Lieutenant and his loader. The driver managed to escape. The vehicle was defenseless against Soviet tanks. What is amazing about this battle is that all the other BT-42 tanks were not lost by enemy action but mechanical failures. Seven of the tanks had to be abandoned by the crew and blown up or set on fire. All the surviving ten BT-42 assault guns were placed in storage at Military Technical Depot (Sotatekninen Varikko) having been declared obsolete in late summer 1944. Nine were scrapped in 1951. One was saved for the Parola Tank Museum and transferred in 1961. That sole survivor is BT-42 Ps. 511-8, former R-708. It took part in the battlefield trials at the River Syvari / Svir in 1943 firing at Soviet targets on the other side of the river.